I would never of believed that the Shadows would walk away so easily. Except that Lorien told them then it was time to go. Lorien is the being whom the Shadows thought so highly off so much that they kept coming back to Z'ha'dum all the time. So why the hell did he just not tell them to stop being silly buggers and wiping people out. My point was(I think)that the Shadows and Vorlons behaved like spoiled kids who had misused their toys.Expected a little more from them than "ok,we've been told off,we'll go and play nicely somewhere else". I've wondered that, too. Why was Lorien just hanging out underground when apparantly all it took was his company for the shadows and vorlons to happily go skipping off beyond the rim. I suppose the Vorlons and the Shadows had to learn first that these younger races weren't going to play their game anymore. Lorien alone wasn't enough to convince them to take off and leave us alone, the realization that they had no constructive purpose anymore was. That and having "Daddy" come and say "it's alright, I'll go with you". There is also the question of whether Lorien was waiting for evidence that the younger races were ready to be left alone. It's one thing for him tto know that the babysitters have started worrying more about their methodology debate among themselves than they are about doing their jobs as well as they might. It's something else for him to be convinced that no supervision at all is better than what they have now. Didn't Lorien make a comment to Sheridan (when he was still dead on Z'ha'dum) about being the first to make it "this far". Maybe the Vorlons and Shadows would have left earlier if Lorien had gotten their attention sufficiently vigorously and told them to. But maybe *he* was waiting to do that until the younger races had demonstrated to his satisfaction that they didn't need their older babysitters any more. Naturally, we are well out into the realm of speculation here ...... not reasoning supported by a whole lot of hard evidence. Oh, that makes sense, though. No, that's a great explanation, Pillowrock. He waited long enough.What's the worse the younger races could of got up to without the older races?Have a few wars,we know that happened even down to the extent of the Dilgar being exterminated.Where were the older races then with their so called guiding hand?As I see it they did nothing to really help any of the younger races at all apart from modifying them for there own purposes.The only guidance given was to counteract each others machinations.In the end the older races come across as more childlike than the younger races. Does anybody really think that *every* single ship in the galaxy (from either the Shadows or the Vorlons) was at that battle? No, especially considering that we were actually shown that they weren't, i.e. 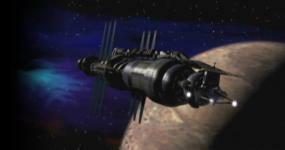 the Vorlon fleet that was sent to Centauri Prime that the Vorlons recalled when their fleet at Coriana got smooshed. It's not a far step to realizing there are plenty of other ships elsewhere in the galaxy. Yup, he did indeed tell Sheridan that he was the first one to make it that far. PillowRock's explanation for why Lorien waited as long as he did is, I think, spot on. Another tidbit: someone once pointed out that the real pivotal moment came when the Shadows fired their missile at Sheridan's White Star and the Drazi ship intercepted it. When the Vorlons and the Shadows realized that the younger races were no longer willing to die for them, but instead for each other, they realized that playing their game would be a lot harder now. Plus there's Lorien telling them it's time to go... and let's not forget the other First Ones all standing around, tapping their feet impatiently. That was also one of my pet peeves about situational consistency. A missile whose counterparts seemed quite capable of burrowing deep into a planet, through kilometers of quite hard rock... had trouble leaving a smoking hole into a Drazi ship, and continuing on its course unaffected. The answer of course, might be that the missiles might require a program to tell them when to slip through an obstacle, and who instructed the missile to fire either forgot or didn't bother to configure it. Most likely, it was configured properly... for killing a ship. Heavily philosophical, I am always torn between wanting to see this end in explosions or reason. I suppose we get our explosions with the earth conflict. I would've liked to have seen this as a 2-parter, but after reading the lurker's guide, I've got to agree that more shooting and space battles wouldn't have changed the way it had to end. Sheridan himself said that they could not win that battle, and to have them do so would have been unnatural given the strength of the first ones. The story always gets me wondering why the Vorlons went nuts when they did. Perhaps it was the death of Kosh, but I feel like the reasons as to why the Vorlons and Shadows don't attack each other is essentially valid. It goes beyond wanting to leave the other side alive so they can see that you are right. To erase the other side would be to admit defeat. It would have meant admitting that the idea of evolution through chaos was more attractive to the younger races, and thus must be destroyed. If the Shadow idea was truly weaker than the Vorlon idea, it would fall on its own without Vorlon intervention. It's analogous to wanting to be the fastest runner in the world. Rather than training to be the fastest, you simply kill everyone who runs faster than you. Of course, doing so wouldn't really make you any faster, you'd simply be the fastest person that anyone else knows about. Ok, that was a silly analogy... but the point is that for one race to eliminate the other would have been admitting idealogical inferiority. So IMO it goes a little bit deeper than leaving the other side around just so they see you succeed.